The recordings released by Don Robey's group of companies are a veritable treasure house of southern soul. It is a crying shame that contractual and corporate issues mean that they may well stay out of the public arena and the hands of reissue companies for a long time. 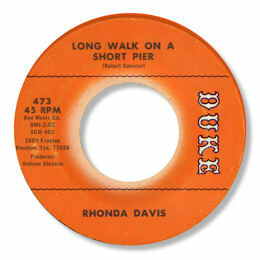 One of the 45s that really deserves a wider audience is this one by Rhonda Davis - her only secular 45 that I know. Rhonda had two gospel singles out before trying her hand at secular music and as usual it is the uptempo side that that has made this a highly desirable - and expensive - 45. The tracks were cut on the West Coast using Eugene Blacknell's band and then bought in by Robey as so many of the later Duke releases were. I quite enjoy "Can You Remember" with its distinctly Motown feel to the arrangement, especially the horns and strings, but my preference would be for the doom laden flip Long Walk On A Short Pier. It's hard to imagine a more depressing lyric than this tale of betrayal and despair and Rhonda invests it with a suitably downbeat air accompanied by some tasteful "wah wah" guitar licks from Blacknell and shimmering strings. A lovely bluesy minor keyed ballad. Don't listen to it at 3.00 am though. UPDATE ~ Alan Wheway has written with details of an earlier gospeL 45 by Rhonda - "God is my refuge" / "He watches me" Peacock 3056 (1965?). I'm grateful to him. Thanks to Colin Dilnot and Alasdair Blaazer.